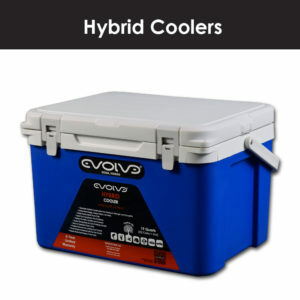 The Evolve HYBRID series coolers and DURO series coolers have arrived! First up is the new Evolve HYBRID coolers, there’s not a lot like this right now. HYBRID means this is halfway between a high-end rotomold cooler and the low-end box store special. Using the same injected foam as our rotomold coolers, the HYBRID is half the weight and half the price! 19 qt keeps ice for 3-5 days! It’s truly time to EVOLVE! Next up is the Evolve DURO series which is rotomolded to provide an extremely rugged construction. Seamless design allows ice to last 7-10 days! The 22 qt sells for $139.95 – which is $60 less than the comparable “Abominal Snow Man” cooler of the same size! Won’t bend or bow in the sun like the “Australian” box coolers either! Just can’t stop evolving! 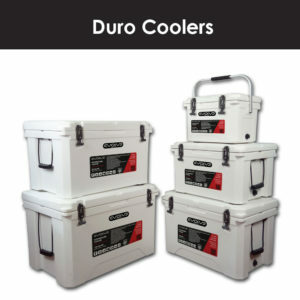 What is the dimensions for the 120 quart cooler? Is the dimensions internal measurements or overall measurement? The outside dimensions – however please note we are now out of stock on all of the Rotomold coolers except for the 22QT now. I assume the rubber latches will eventually give our. Do you sell replacement parts? Hi, yes we have replacement parts for latches, plugs, etc. Hopefully January! We will be posting on FB and IG when we do.